Ole Miss Seniors: It's time to show your loyalty to your university by answering its most famous, time-honored question, "Are you ready?!" Are you ready to be part of something great? Are you ready to give back to the school you've grown to love? Are you ready to leave a lasting legacy on the Ole Miss campus? Each year, the senior class provides Ole Miss with a gift that stands as a permanent testament to its graduates. The Ole Miss Class of 2017 is ready. It's our turn to shine. Our Legacy Gift -- a commemorative plaque contextualizing our legendary “Hotty Toddy” -- will be displayed on the new extension to the Walk of Champions leading into the newly renovated Vaught-Hemingway Stadium. Countless Rebel fans, alumni, students and visitors alike will have the opportunity to view our historic landmark as they are welcomed into one of the most cherished college football venues in the country. Seniors, let's leave a mark on campus that will stand the test of time! This year’s Legacy Gift will undoubtedly do just that. Every year, the Ole Miss senior class strives to gather the best participation for the Legacy Gift. This year, our goal as Hotty Toddy Seniors is to have more participation than any other senior class. With this ambitious goal before us, we will absolutely need your help and the help of each of our classmates. Last year, nearly 750 seniors helped make the Class of 2016 Legacy Gift possible. This year, we want at least 1,000 seniors to join together to establish our legacy. How can you help? Like and share our pages, tell your friends about the Legacy Gift, and most importantly – donate! Billy Brewer, Rebel football coach from 1983-1994, was the only SEC coach who did not bus his team out of town on Friday nights. The team would stay in Kinard Hall and then walk together through campus to the stadium on game day. However, one Saturday, Coach Brewer decided to give his team extra motivation: he wanted the players to feel the electric atmosphere of college football by walking through the most spirited part of campus on game day -- the Grove -- amid the roaring cheers of adoring fans. 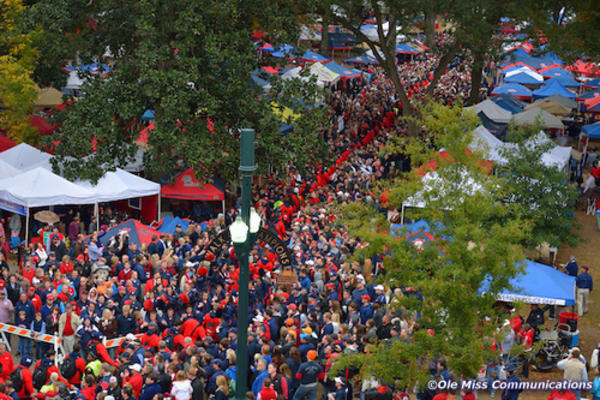 And so was born a new tradition at Ole Miss: the Walk of Champions. The “Walk of Champions” was erected in 1998 by the 1962 Ole Miss football team, the only team in Ole Miss history to finish with a perfect record of 10-0. Soon, the “Walk of Champions” will be extended into the newly renovated Vaught-Hemingway Stadium. 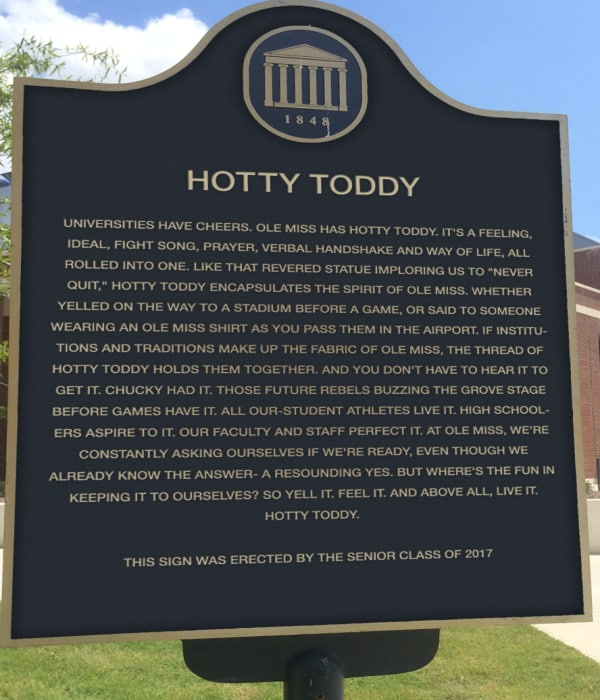 Near that entrance, our historic marker will be a permanent fixture, explaining the tradition and meaning behind our beloved phrase, “Hotty Toddy.” Seniors, together we can show our appreciation to our great university by donating to this commemorative endeavor. Let's do this! Join us at Rafters on the Square Wednesday, Aug. 24, at 9 p.m. to celebrate the launch of our project. Your $5 donation will benefit the Hotty Toddy Historic Marker. 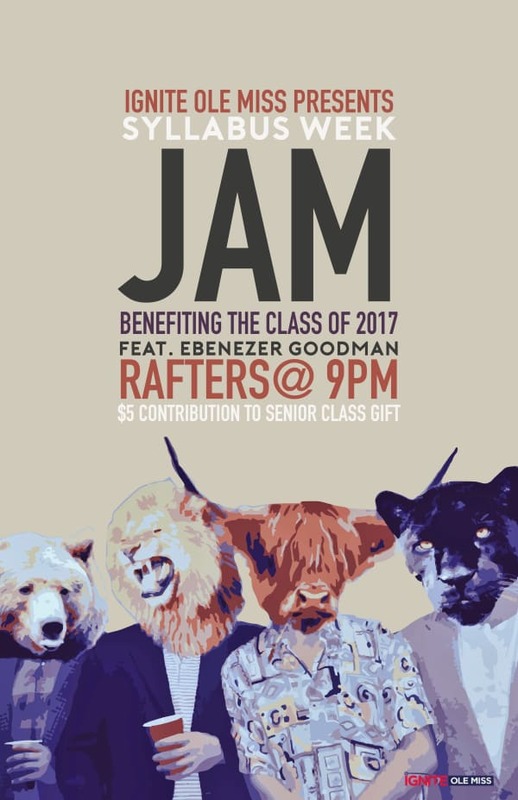 The local Oxford band, Ebeneezer Goodman, will begin playing live music at 10:00! Please make a contribution today and help us reach our goal of 1,000 seniors! Use our suggested donation levels on the right side of this page! In addition to supporting our project financially, please help us even further by sharing our project with your family and friends via email, Facebook, Twitter and Instagram. Like and follow "Ole Miss Senior Fund" on Facebook, Twitter and Instagram for announcements and updates! Thank You and Hotty Toddy! Parents, if you are making a contribution on behalf of your senior student, please provide their name on the donor form. That will enable us to count your senior towards the participation goal of the Senior Class! Thank you! 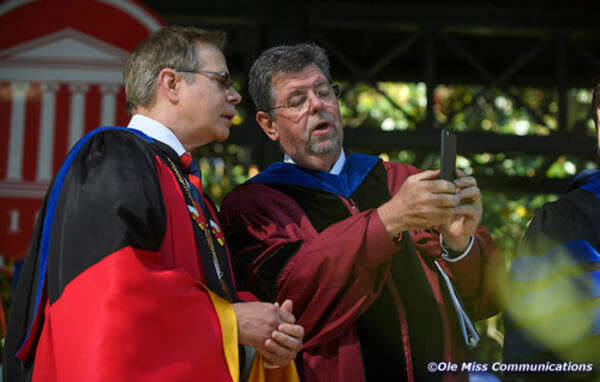 For more information, contact William Kneip, project director, at wbkneip@olemiss.edu.